Properties in Georgetown average 4.8 out of 5 stars. Property 2: Enchanting Five Islands - Home of the biggest lobsters and deep water for boats! Property 3: Loony Bin Cottage - A stones throw to the water's edge. Property 5: Private waterfront home w/ large deck and deep water dock! 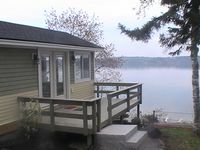 Property 9: Beautiful Cottage On Water, Near Beach!! Property 11: Coastal Island Retreat - Privacy and Convenience. Boat rental available. Property 17: Five Islands, Quintessential Maine Coastal Living, A Perfect Maine Destination! Property 22: Enjoy this little cottage in the woods built by Grandy and Grandma! Property 24: Your own private island! Rustic and close to Nature. 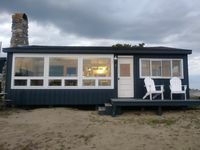 Property 36: 3 bedroom cottage only 187 steps away from Popham Beach! Property 38: Welcome to "Captain's Catch"! Quaint, quiet and affordable cottage awaits! Property 42: Driftwood Cottage - Renovated Oceanfront with Stunning Views in East Boothbay!